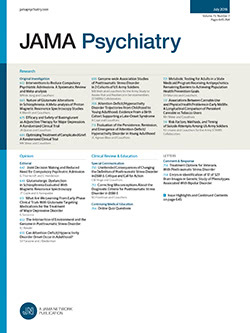 Background: This study provides, to our knowledge, the first empirical test of whether behavioral differences among children in the first 3 years of life are linked to specific adult psychiatric disorders: anxiety and mood disorders, antisocial personality disorder, recidivistic and violent crime, alcoholism, and suicidal behavior. Methods: In a longitudinal-epidemiological study, 3-year-old children were classified into groups based on examiner observations of their behavior. At age 21 years, they were reassessed for psychopathologic functioning using standardized interviews based on DSM-ÏÏJ-R criteria. Results: Although effect sizes were small, undercontrolled (includes children who are impulsive, restless, and distractible) and inhibited (includes children who are shy, fearful, and easily upset) children differed significantly from comparison children in young adulthood. Undercontrolled 3-year-olds were more likely at 21 years to meet diagnostic criteria for antisocial personality disorder and to be involved in crime. Inhibited 3-year-olds were more likely at 21 years to meet diagnostic criteria for depression. Both groups were more likely to attempt suicide, and boys in both groups had alcohol-related problems. Controls for family social class did not change the findings. Conclusions: Some forms of adult psychopathologic abnormality are meaningfully linked, albeit weakly, to behavioral differences observed among children in the third year of life.